My database suggests that February 1864 was not month for memorable events. February 1914 was a more interesting month, though only slightly. On 9 February we find a significant change in the way the Metropolitan Railway organized its services at the west end of its inner London network. Before the Metropolitan electrified in 1906, many trains running along the north side of the Circle Line ran through to the East London Railway, terminating at New Cross. The East London was operated by a joint committee of five different railway companies who had differing ideas about how services should be developed and who were disinclined to pay for electrification. Although the Metropolitan retained an interest in the line, without electrification it was unable to maintain a through train service, which from December 1906 was diverted to Whitechapel. Plummeting traffic levels along the East London finally induced the joint committee to electrify and through trains ran once more, from 31 March 1913. This service at first worked from New Cross to South Kensington, via the north side of the Circle. It is often forgotten that the Metropolitan owned the line all the way round the west side of the Circle via High Street Kensington to South Kensington (the District had a parallel tunnel between South Kensington and High Street Kensington). At South Kensington there was a bay platform, used by the New Cross trains, between the District and Metropolitan parts of the station, roughly on the line of the stairways to the Piccadilly Line that can be seen today. The East London service was superimposed on the existing Circle (then called the Inner Circle) and Hammersmith – Whitechapel trains, but was evidently not found very convenient to operate. From 9 February 1914 the western terminus was switched to Hammersmith, improving frequencies on that branch and setting the service pattern for the next twenty years or so. At the New Cross end, trains alternately served the stations of the South Eastern Railway and the London, Brighton & South Coast Railway (from 1923 called New Cross Gate). On 12 February 1914 Metropolitan Railway shareholders first met at the new general offices at Baker Street, described last month. This was not the most historic event to affect this interesting little railway, but it was an opportunity to show the shareholders where their money had been spent. Prior to that shareholders had gathered at hotels for their various meetings, the Cannon Street hotel had been a favourite. 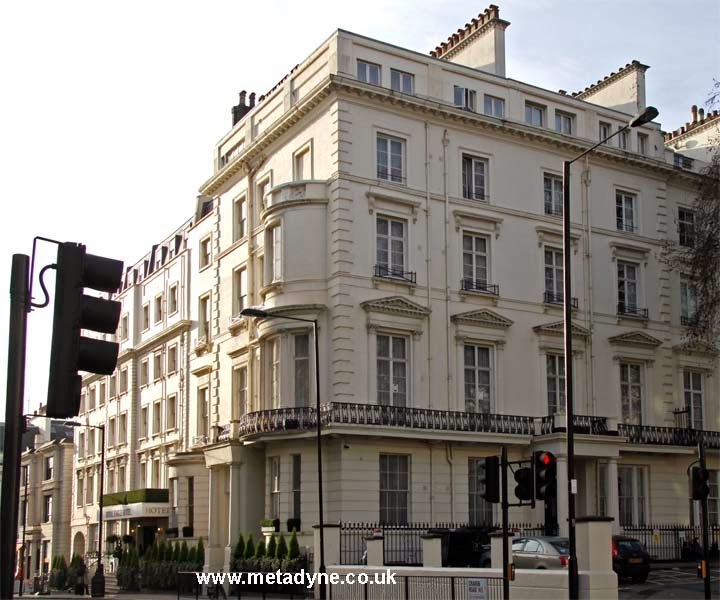 I mentioned last time that prior to moving into the general offices the Metropolitan had occupied several small offices in the Paddington area, usually in buildings it owned. I show, below, a couple of photos of their buildings, which still stand. A look at a large scale map indicates that the buildings were located very close to the railway and this is no accident. At the time when the railway was being built the law was that if a railway needed to use its compulsory purchase powers to buy any part of a property it had to buy the whole of it. Based on the premise that property included the subsoil out to the middle of the road, old properties often included coal cellars beneath the pavement (and often part of the roadway). When the Metropolitan Railway came along, it can be seen that even though it was often built under the road it became necessary to buy rather a lot of property, much of which it then hung onto (it had acquired special powers to do this, while other railways were forced to dispose of surplus land). Using some of this portfolio for its own purposes was therefore very sensible. 5-7 Craven Road, Paddington, the upper floors of which were used as Metropolitan Railway offices between 1872 and 1878. The railway runs at an angle beneath the building. The building in foreground is 32 Westbourne Terrace, Metropolitan Railway offices 1869 – 1914. The building to its left (now the Royal Eagle Hotel) is at 26 Craven Road and appears to be linked to the main building. This served as offices from 1878 for the Estate, Accounts and Stationery departments. The railway runs immediately in front of the front walls, along Craven Road, probably under the cellars. At Earls Court, track rearrangements in February 1914 improved the flexibility of services. I have mentioned Earls Court before, indeed, last month I included some diagrams. If you refer to them you will see that trains going east converged onto a single eastbound line as far as Cromwell Road, where the High Street service diverged. This was a huge constraint to services, but the later expedient of turning the siding into a through line was not then possible: the siding was needed to turn round the Willesden-Earls Court service operated by the London & North Western Railway. The improvement just referred to involved changing the locking so that passenger trains from eastbound local platform (the second one down) could at the signalman’s discretion use the rightmost crossover to reach the eastbound line. If an eastbound train from the other platform were passing, the local train could stand clear of the platform (across all the pointwork) leaving the platform behind it clear for another train to pull in. Such was the intensity of service in those days, this alteration was felt worthwhile (the Board of Trade was not entirely happy with this, but conceded the advantages). February 1964 includes several dates that could be commemorated, though none of very much importance. On 3 February the difficulties of recruiting staff hit home on the Metropolitan Line when a reduced train service had to be introduced. The staff shortage (mainly staff retention) had many different causes, and took years to address. It started in the 1950s when it became difficult to recruit staff prepared to endure shiftwork, and led to recruitment overseas. During the 1960s things got progressively worse, not helped later by the need to recruit additional staff for the Victoria Line. All lines were affected by the shortage, but the Metropolitan more conspicuously so with its wider intervals and its operation to a public timetable. Things got very bad during 1963 when large numbers of trains were cancelled daily, leaving extremely long and unpredictable gaps. The 1964 emergency timetable was a tremendous disappointment for London Transport, following on from the introduction of gleaming new trains on the Metropolitan, and completion of 4-track works and electrification to Amersham. Seven trains were withdrawn from the schedule during the morning peak, and five in the evening. The off peak fast service on the Amersham line (remember them?) was reduced to hourly and some Watford trains were diverted to Rickmansworth. Staffing remained so bad that it was still necessary to cancel trains ‘randomly’ as well. It was a very sorry time and took the edge off the huge investment in the new improved train service that had been promised. It is arguable, but with staffing difficulties and the long term trend in falling traffic, the Metropolitan never used all these new facilities to capacity. Not much else happened that month. Mill Hill (The Hale) goods yard closed. Intermediate between Mill Hill East and Edgware, it was on the line that should have become part of the Northern Line in 1940, but diversion of effort into war work meant the electrification was never completed. The LNER (and later British Railways Eastern Region) carried on with freight trains that served the goods yards, but passenger services stopped on a temporary basis on 11 September 1939 and were never resumed. Through tickets were accepted on local buses for a while, retaining the fiction of a railway, but these eventually died away. Today, communications between the large suburban centres of Edgware and Finchley are very slow and indirect and, incredibly, there is no direct bus. On what should have been a more positive note, on 17 February 1964 LT announced the rebuilding of the Northern Line ticket hall at Elephant & Castle. This unfortunately meant the destruction of the old City & South London station building and roof dome and the construction of a new station building around the existing shaft, the old building being partly in the way of the monstrous 1960s road widening scheme that ran between two giant roundabouts that came to typify this area. None of this benefited the locals, of course, and simply divided communities. Wholesale destruction of communities was followed up by an anonymous shopping centre and truly vast blocks of flats, later to found unpoliceable and the source of all kinds of unforeseen social difficulties and which, as I write this, are being torn down, and not before time. The mean new station building, opened in April 1965, was barely large enough, even at the time. Bristling with glass and chrome, so as to fit in with the social experiments taking place all around the area, it did not take all that long before it looked shabby either. The lifts were not replaced, requiring another lengthy closure in 1983 when two tiny lift cages were installed instead of the larger Otis cages. Happily, this wretched station building has already been torn down, being replaced in December 2003 by something less mean and more fit for purpose (requiring yet another long closure). Even now, the new station is recognized to be inadequate for the growing traffic and expected developments. What is actually needed is a proper new station and transport interchange here, and the pre-WW2 aspiration to have escalators and combine the separate Bakerloo and Northern Line ticket halls. A pre 1964 view may be seen HERE and HERE, and a post 1965 view HERE.